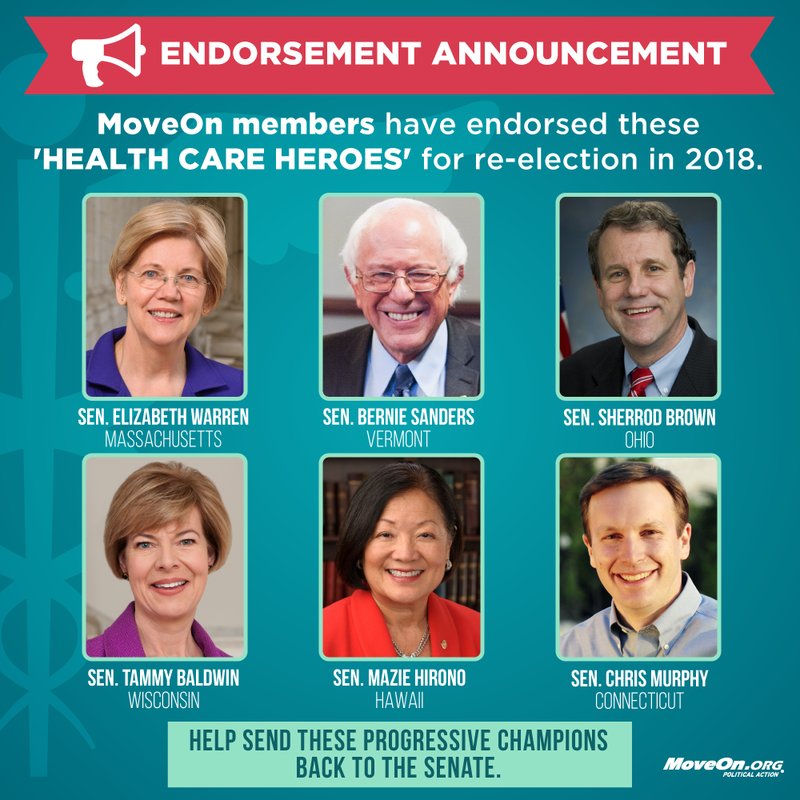 Following their votes to help defeat Trumpcare in the Senate last week, six incumbent Senators have won the votes of MoveOn.org members in their states as part of a “Health Care Heroes” endorsement push; members voted to back Sens. Bernie Sanders (VT), Elizabeth Warren (MA), Mazie Hirono (HI), Sherrod Brown (OH), Tammy Baldwin (WI), and Chris Murphy (CT) for re-election. Each won more than 99% of votes cast by members in their state. The endorsements come days after a Republican-led effort to repeal the Affordable Care Act and take a wrecking ball to health care coverage in this country failed by one vote. In an email to MoveOn.org members nationwide, organizers noted the closeness of the vote and the importance of re-electing progressives candidates to fight Trump’s agenda. These six senators have worked tirelessly to improve the lives of their constituents and to stop Trump’s attempts to divide our country, shred our Constitution, and hurt the livelihoods of regular Americans. And they’re critical in helping build the progressive agenda we need to see in Washington. • Bernie Sanders of Vermont has spent decades leading on progressive issues, from universal health care to publicly funded elections to opposing unjust wars. As we all know, he’s been tirelessly rallying Americans to resist Trump and advocate for progressive policies like Medicare for All. He’s worked with MoveOn members to defend Social Security and Medicaid and just last month hit the road at MoveOn-sponsored rallies against Trumpcare. • Elizabeth Warren of Massachusetts has proven that Democrats can successfully stand up to Wall Street. She helped create the Consumer Financial Protection Bureau, has forcefully pushed for reforms to student debt, and has worked alongside MoveOn members to tackle income inequality. The Senate tried to silence her outspoken opposition to Jeff Sessions for attorney general in the Senate, but still she persisted. And her vocal criticism of how billionaires have rigged the economy against working people has made her a top target of right-wing groups. • Sherrod Brown of Ohio is a true champion for working people everywhere. He’s leading the fights for a $15 minimum wage and an infrastructure plan that would put millions more Americans to work. He’s showing what true populism looks like in a state Trump won handily—and if he can win, it could be a model for how we beat Trump in 2020. • Tammy Baldwin of Wisconsin led on numerous progressive issues in the U.S. House before becoming the first openly gay candidate elected to the Senate in 2012. She’s continued championing progressive issues such as universal health care and ending the revolving door for lobbyists in Washington. She’s worked with MoveOn members to offer real solutions to tackling Big Money and the conflicts of interest that are poisoning our democracy. And she’s in a state that Trump won last year, holding a seat Democrats need to hold on to. • Mazie Hirono of Hawaii was a leader in the House Progressive Caucus for years before bringing her strong principles to the Senate. Last week, she flew back to Washington, D.C., despite being recently diagnosed with cancer, to speak out powerfully on the floor of the Senate against Trumpcare. She has been an energizing and inspirational voice for MoveOn members in the fight for health care. • Chris Murphy of Connecticut was elected to the U.S. House in 2006 on an anti-Iraq War platform and he has been advocating for a more progressive foreign policy in Congress ever since. As a U.S. senator, he championed the diplomatic agreement with Iran and has spoken forcefully about stopping future wars under Trump. And as the senator representing Newtown, he’s never been afraid to take on the NRA and call for sensible gun legislation—even holding the Senate floor last summer to raise the alarm about assault weapons after the Orlando shooting. The 2018 election is of critical importance and MoveOn is accelerating its support of progressive candidates up and down the ballot, including with additional endorsements of 2018 progressive candidates in the weeks and months to come. MoveOn.org Political Action represents the collective will of MoveOn’s members at the ballot box by helping to elect progressive candidates. In the 2014 election cycle, MoveOn members made over 6.7 million phone calls for endorsed candidates. MoveOn members have also raised millions of dollars—including more than $1 million for Sen. Elizabeth Warren’s Senate race in Massachusetts in 2012 and more than $1.2 million for Bernie Sanders’ presidential campaign in 2016—mobilized volunteers, and run ads in support of endorsed candidates across the country.